100/159 David Mumpower This is easily the best of the 2006 Fat Suit films. That's an honor on the level of being the best N'Sync song. 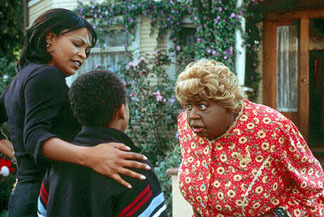 Back in 2000, Martin Lawrence became one of Hollywood's more bankable stars with the unexpected hit Big Momma's House. Since that time, he's seen his share of failures, with Black Knight and What's the Worst That Could Happen coming up as pretty major disappointments. It took Bad Boys II, a sequel to Lawrence's breakout hit with Will Smith, Michael Bay and Jerry Bruckheimer, to remind movie audiences that his films can indeed make some solid coin. So it's really no surprise that Lawrence returns to another of the films that did so well financially, as a sequel for Big Momma's House is in the works. The real question is whether such a follow-up is just too late, as it will come nearly five years after the original. The first Big Momma's house centers around FBI agent and master of disguise Malcolm Turner. His newest assignment brings him to a small southern town, where he's looking to capture a brutal bank robber/recent prison escapee. His stakeout is set across the street from the home of a woman known as Big Momma, who is about to be visited by the criminal's ex-girlfriend, Sherry, and her son. Unexpected problems arise when Malcolm learns that Big Momma has up and left town. As a solution to this unforeseen turn of events, Malcolm decides that he will impersonate Big Momma, even going so far as to incorporate her daily activities such as cooking soul food, delivering babies, and "testifying" at the local church. Not only that, but he physically transforms from a slim, attractive man to a corpulent, elderly woman. Complicating things further, Malcolm finds himself falling for Sherry, who may or may not be a bad guy. Naturally, if anyone can solve the case, it's our hero. See the latest developments for this project on the Big Momma's House 2 Movie News page.